GCA Advises Anritsu Corporation (TSE:6754) to acquire Azimuth Systems Inc.
We are pleased to announce that our client, Anritsu Corporation (“Anritsu” or the “Company”), a global provider of communications test and measurement solutions, has acquired Azimuth Systems Inc., (“Azimuth”) for an undisclosed amount. Anritsu (TSE: 6754) is one of the longest history Japanese technology company with 120 years of business in communication equipment and test & measurement industry. The Company provides solutions to its customers helping develop wireless, optical, RF and digital products and solutions. Azimuth, based in Acton, MA, is a VC backed technology venture and specialist provider of wireless performance test solutions. 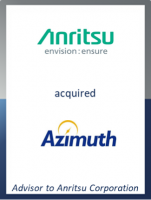 By acquiring Azimuth, Anritsu will integrate Azimuth’s RF channel emulation and “Field to Lab” controlled RF environments technology, product portfolio and installed base for the growing IoT and 5G deployment markets. The transaction is structured as cash merger with Anritsu’s US merger sub. The merger agreement was signed and the merger completed on September 28th, 2016. GCA acted as exclusive financial advisor to Anritsu in connection with this transaction. GCA teams in Japan and US provided services around all aspects of the transaction with the client who has been away from M&A market for more than a decade.